Hey there, it's Mary Dawn here. I'm bringing you a card I created for November Release Week. Unfortunately, I was unable to get my projects to Danielle because of an emergency. But that means I'm off the hook for my December post...sort of. I made this fun card with Miriam's genius On The Corner set. I stamped the street sign in Memento Tuxedo Black Ink and colored it in with my Spectrum Noir Alcohol Pens. When my coloring was done, I stamped Freaking & Fantastic in Versamark ink and embossed with white embossing powder. This set is so fun and different. I love all of the fun word combinations you can make. 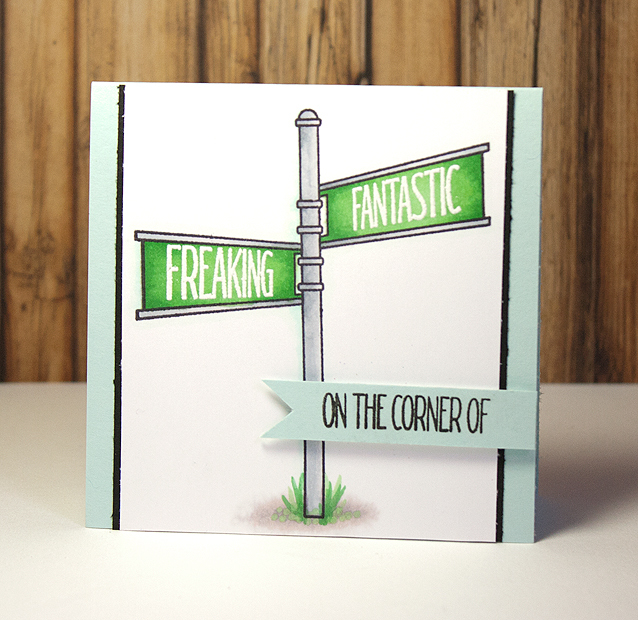 Love the coloring and embossing and the bit of grass! Loved your posting with these crazy moments share. Thank you.